Taking a snapshot of your Android phone’s screen is easy, and there are all sorts of situations where a screenshot could come in handy, whether you want to share your home screen with friends or obtain pictorial proof of your latest high score. This guide covers the Samsung Galaxy S9, Galaxy S9 Plus, Galaxy Note 8, Galaxy S8, Galaxy S8 Plus, Galaxy S7, Galaxy S7 Edge, Galaxy Note 5, Galaxy S6, Galaxy S5, Galaxy S4, Galaxy S3, Galaxy Note 4, Galaxy Note 3, Galaxy Note 2, and Galaxy Note as examples. We also included a guide to taking a screenshot on any other device using Android 4.0 Ice Cream Sandwich, Jelly Bean (4.1, 4.2, 4.3), KitKat (4.4), Android 5.0 Lollipop, Android 6.0 Marshmallow, Android 7.0 Nougat, Android 8.0 Oreo, and Android 9.0 Pie (that’s most of them). 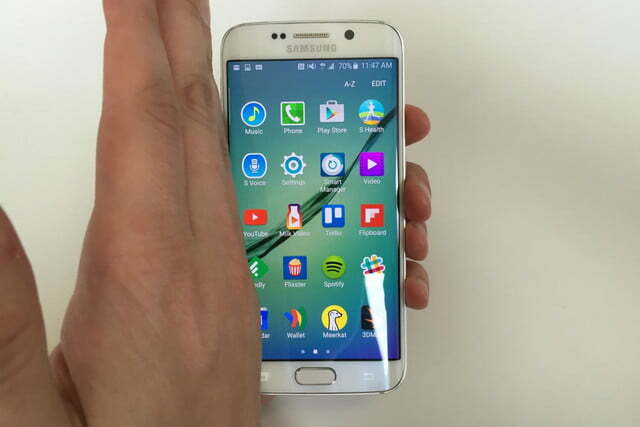 To take a screenshot with "Palm swipe to capture," first position your hand like this. 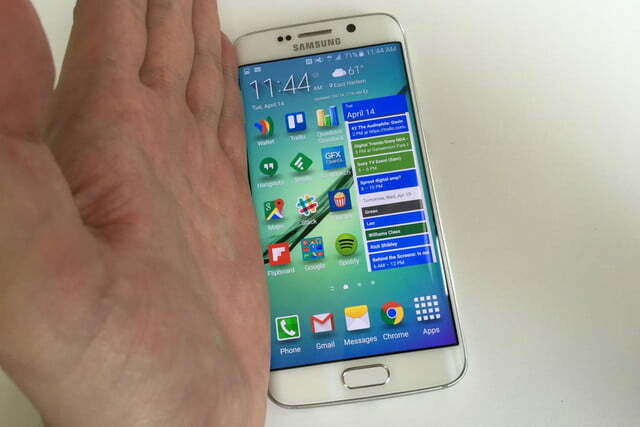 Next, swipe your hand from left to right, keeping your palm on the screen. If you do it right, you should feel a vibration. You can easily access your screenshot from the notifications menu. Taking a screenshot on the Galaxy S8 — or almost any other Galaxy phone — with a swipe of your hand is easy. Set your hand vertically on either side of the screen, and shape it like you are karate-chopping the phone. Horizontally swipe across the screen like your hand is a photo scanner. You should hear the camera shutter, see a screenshot move across the screen, and receive a notification that a picture has been saved to the gallery. 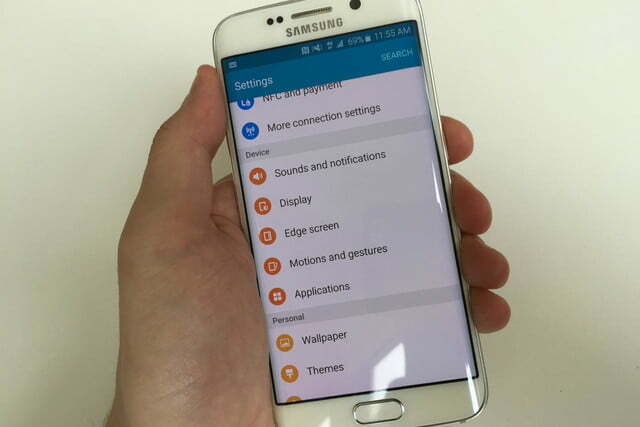 This technique works with the following devices, as well as most Samsung phones that came out after 2013. The Samsung Galaxy S9, Galaxy S9 Plus, Galaxy S8, Galaxy S8 Plus, Galaxy S7, Galaxy S7 Edge, Galaxy S6, Galaxy S6 Edge, Galaxy S6 Edge Plus, Galaxy S5, Galaxy S4, Galaxy Note 8, Galaxy Note 5, Galaxy Note 4, and Galaxy Note 3. In the Settings menu, find "Motion and gesture." Inside the "Motion and gesture" menu, you can turn Palm swiping on or off. If you're accidentally taking screenshots, we recommend you turn it off. If you can’t get it to work, you may have to enable the swipe feature in Settings. Open Settings > Advanced features. 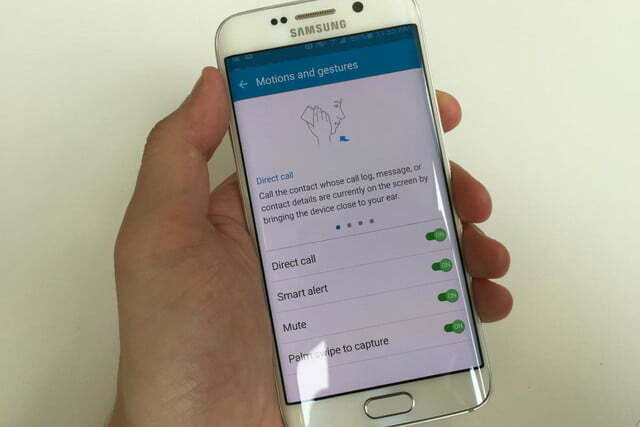 On some older phones, it will be Settings > Motions and gestures (in the Motion category). Tick the Palm swipe to capture box. Close the menu and find the screen you want to capture. Not everyone is a fan of gesture controls. 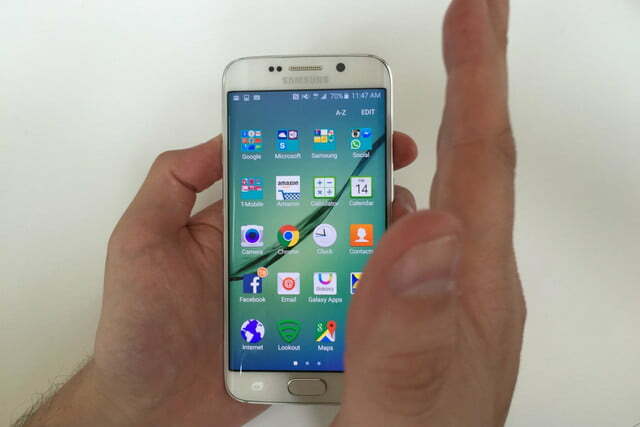 Thankfully, most Android phones offer a more tactile method for capturing a screenshot. To take a screenshot using buttons, put your fingers on Power and the Home button. Press and hold both buttons at the same time. You can review your screenshot in the notifications menu. Press the Power and Home buttons at the same time. Hold both buttons for a second, until you hear a shutter sound or see a visual indicating a picture has been taken. This can be awkward to get right. You need to hold the Power button slightly before pressing the Home button, then hold them both down. 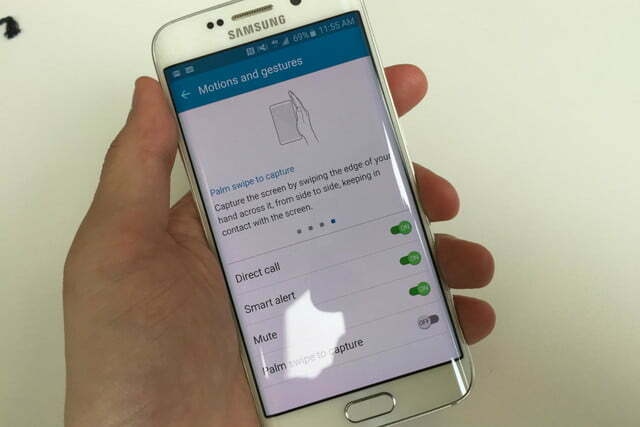 This technique works with the following devices, along with pretty much any Samsung phone that has a Home button. The Samsung Galaxy S7, Galaxy S7 Edge, Galaxy S6, Galaxy Note 5, Galaxy S5, Galaxy S4, Galaxy S4 Zoom, Galaxy S4 Active, Galaxy Note 4, Galaxy Note 3, Galaxy Note 2, Galaxy Mega 6.3, Galaxy Tab 3 Pro, Galaxy S4 Mini, and Galaxy S3. You need to hold the Power button slightly before pressing the Volume down button, then hold them both down. 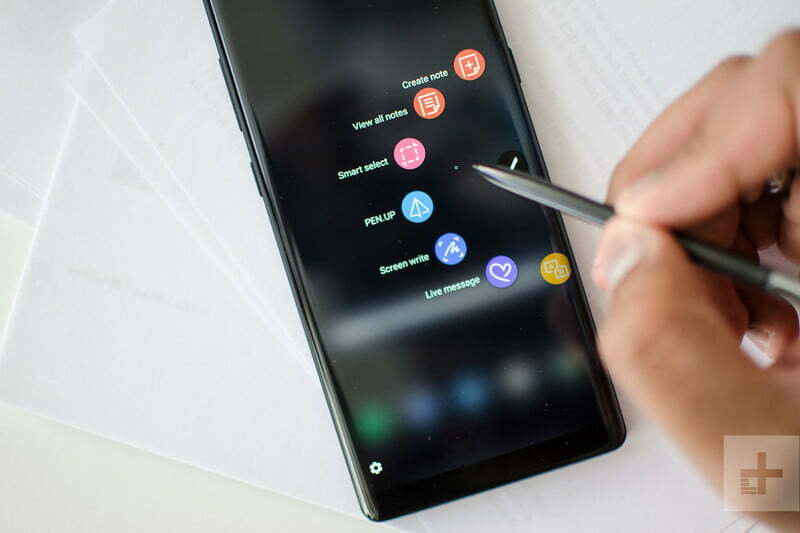 This technique is available on the Galaxy Note 8, Galaxy Note 5, Galaxy Note 4, Galaxy Note 3, and other Samsung devices with an S Pen. 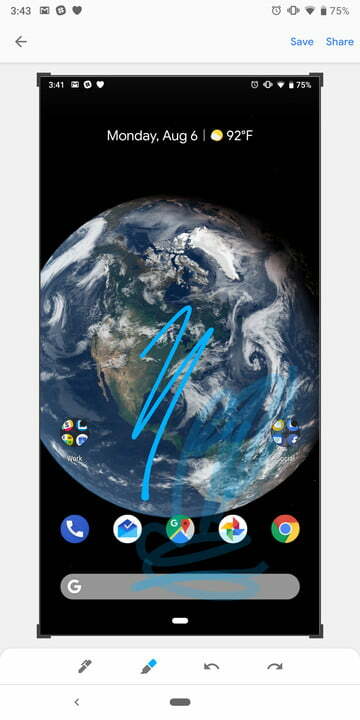 To take a screenshot this way you have to open the Air Command menu, which you can do by pulling out the S Pen stylus, or by hovering the pen over the screen and clicking the button on it. Select Screen Write from the Air Command options to take a screenshot. You can then write notes on top of the image. There are options in the top toolbar to change your pen color and size if you want to get creative. You can also erase or undo strokes and there is a Crop option at the bottom. When you’re finished, tap Share or Save at the bottom. 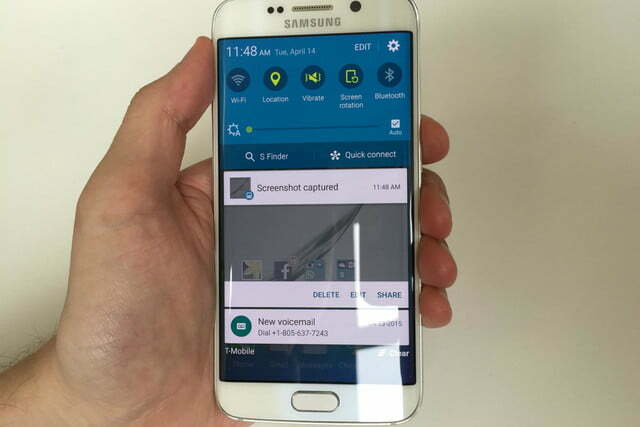 Taking a screenshot on any other Android phone or tablet — as in, one that is not a Samsung device — is also pretty easy. The method varies slightly from one model to the next, however, the following method should work on all non-Samsung Android phones running Android 4.0 Ice Cream Sandwich or later. Press the Power button and Volume down key at the same time. Hold them down until you hear an audible click or a screenshot sound. You should also see a small capture animation. 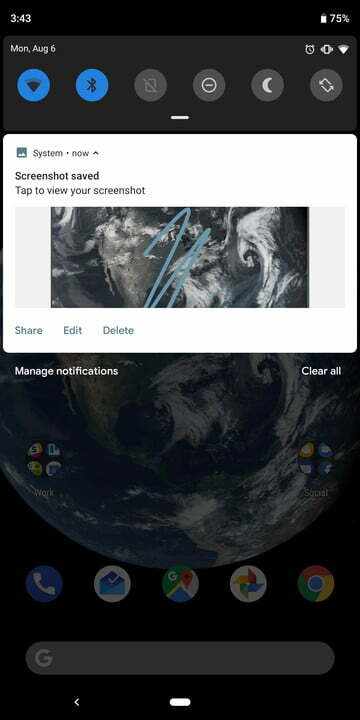 You will get a notification that your screenshot was captured, and that you can share or delete it. By default, your screenshots are saved in your Photos or Gallery app in a separate Screenshots folder. 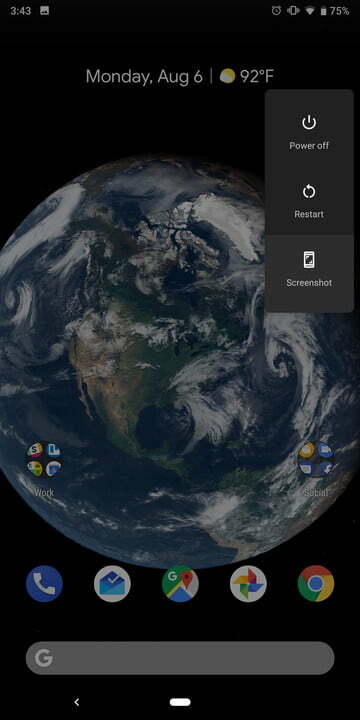 In Android 9.0 Pie you can also press and hold the Power button to get a Screenshot option to pop up on screen. If you choose to edit the screenshot from the notification bar you’ll also find that you can mark it up, which is ideal if you want to highlight something specific. For ancient Android phones, such as those running 2.3 Gingerbread, you need to head over to the Google Play Store, where there are several apps that will capture a screenshot on your behalf. Screenshot Easy and Screenshot ER are popular choices but may require you to root your phone. You can also take a look at No Root Screenshot It, if you don’t want to root your device. We also have a dedicated guide on how to take a screenshot on a Google Pixel device.